All songs written by Ben Bullington, Wind Whipped Songs ASCAP, except The Last Adios, written by Bill Payne, Carnival Ghosts Music ASCAP, and Ben Bullington, Wind Whipped Songs ASCAP. Recorded and mixed by George Bradfute at The Tone Chaparral in Madison, TN. Additional recording at Electric Peak Recording in Gardiner, MT and Will Kimbrough's Super Service in Nashville, TN. Mastered by Jim De Main at Yes Master, Nashville. 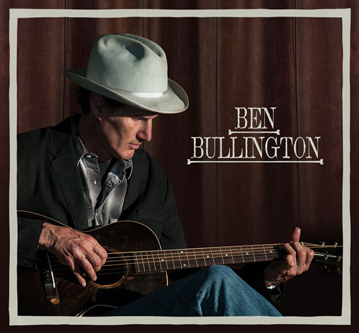 Produced by Will Kimbrough, Ben Bullington and George Bradfute. Thanks to George Bradfute who graciously accepted this musical knave from the countryside several years ago. And to Will Kimbrough; wonderful musician and very successful person. They are brillant men. 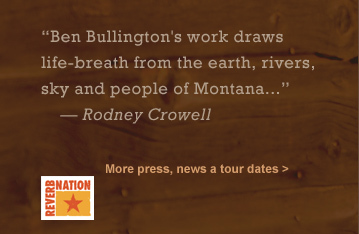 Thanks to my friend Rodney Crowell for his boldness in saying what he thought all along the way. His latest "go small" led to a little 1940 Bigson guitar which has been a revelation. And to Marcus Engstrom who brought that one and many others back to life. Thanks to Bill Payne for inviting me in on "The Last Adios". Enormous and eternal thanks to Joanne Gardner; lioness of a friend and fountain of fun.